Angry Aberdeen residents turned out in force yesterday to protest a “monster” student housing development planned for a former depot. Plans had been lodged to build a four-storey development of 425 students at the former BT engineering depot, at the city’s Froghall Terrace. The telecom firm also planned on building 80 new residential flats on the site. But Froghall, Powis and Sunnybank Community Council have strongly criticised the plans, calling it them an “overdevelopment” and 36 letters of objection were sent. The city council’s planning committee voted against the planning recommendation and rejected the planning permission in principle application last August. But the company said they were “disappointed” by the council decision and have vowed to continue to fight to get their scheme. They have since appealed to the Scottish Government, and yesterday Reporter Rob Huntley visited the site to make his own assessment. He was greeted by local residents holding banners and handing out stickers urging him to once again turn down the plan. Anna Rait, chairwoman of the community council, said: “We aren’t against development, this is just a massive over development. “Parking is already at a premium in the area and to have only 78 spaces for 600 people seems likely only to exacerbate these problems. Council planning convener Ramsay Milne was at the protest and said it was “disappointing” the firm had decided to appeal the council decision. 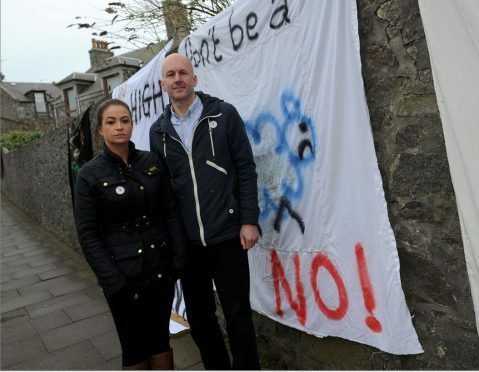 Rob Maund, senior asset manager at BT said: “We were extremely disappointed when the proposals, which would have delivered 80 new homes (20 of which were affordable) and accommodation for up to 425 students, were refused by Aberdeen City Council last year.